An air pressure regulator is typically used in HVAC-R systems, petrochemical processing, slurry processing, and general manufacturing. An air pressure regulator is a vital part of applications where air pressure needs to be reduced or stabilized. An air pressure regulator can be used in manufacturing using manifolds with using the regulators in-line or as stand-alone units with small footprints for use in the laboratory. Air pressure regulators have a very simple operation. As the user manually changes the membrane by use of a handle, the membrane changes proportionally and allows more or less air or gas to the output connections. 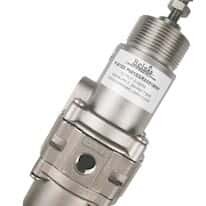 All air pressure regulators will have an output range for you to choose from, and various input and output pressure connections. Included brackets allow you to easily mount transducers in-line or on a panel.